Dua's layer, according to a 2013 paper by Harminder Singh Dua's group at the University of Nottingham, is a layer of the cornea that had not been detected previously. It is hypothetically 15 micrometres (0.59 mils) thick, the fourth caudal layer, and located between the corneal stroma and Descemet's membrane. Despite its thinness, the layer is very strong and impervious to air. It is strong enough to withstand up to 2 bars (200 kPa) of pressure. While some scientists welcomed the announcement, other scientists cautioned that time was needed for other researchers to confirm the discovery and its significance. Others have met the claim "with incredulity". The choice of the name Dua's Layer has also been criticized. In a paper published in 2013, the existence of a new layer was suggested by Harminder Singh Dua et al. Dua's team from the University of Nottingham are conducting transplant-related research on donated eyes. Simulating corneal surgery, they injected tiny bubbles of air into the cornea. Descemet's membrane was surgically removed, causing the air bubble to dissipate in some specimens ("type II bubbles"), but not others ("type I bubbles"). Further experimentation revealed that all air-bubble-free specimens could be re-inflated with a type I bubble. After the bubble was inflated to the point of popping, no further bubble could be formed from further injection, indicating that the bubble was being trapped by a distinct layer of material, not a random variation in the corneal stroma. The experimental results were studied by optical and electron microscopy. The images showed a thin layer of corneal collagen between the corneal stroma and Descemet's membrane. The findings were published in Ophthalmology in May 2013. The paper named the layer after the lead author, Harminder Dua. A press release reported Dua as saying that the discovery meant "ophthalmology textbooks will literally need to be re-written." In a later interview, he offered a more detailed explanation, disclaiming the "rewritten textbooks" of the press release. The authors of the paper believe that it may have important medical implications. The layer may help surgeons improve outcomes for patients undergoing corneal grafts and transplants. 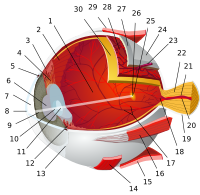 During surgery, tiny air bubbles are injected into the corneal stroma in what is known as the "big bubble technique". Sometimes the bubble bursts, damaging the patient's eye. If the air bubble is injected under Dua's layer instead of above it, the layer's strength could reduce the risk of tearing. The understanding of diseases of the cornea, including acute hydrops, Descemetocele, and pre-Descemet's dystrophies, may be affected if the existence of this layer is confirmed. Harminder Dua believes that from a clinical perspective, there are many diseases that affect the back of the cornea, which clinicians across the world are beginning to relate to the presence, absence, or tear in this layer. Corneal hydrops, a buildup of fluid in the cornea that is common in patients with keratoconus (a conical deformity of the cornea) might be caused by a tear in Dua's layer. Dua hypothesizes that such a tear would allow water from inside the eye to pass through and cause fluid buildup. But Peter McDonnell, the director of the Johns Hopkins Wilmer Eye Institute and chief medical editor of the Ophthalmology Times, said that time was needed “to see if others can confirm the existence of this ‘new layer’ and its potential significance", and added that his own reading of Dua's paper was that "this is not a description of a new layer in the sense of how we think of the corneal layers". In October 2013, Roger Steinert, the director of the Gavin Herbert Eye Institute and ophthalmology chair at the University of California, Irvine, both described the new layer as a "purported discovery" and criticized the choice of name for the layer. "We read the recent claim of the discovery of a new corneal layer by Dua et al with incredulity. The existence of pre-Descemet stromal tissue remaining after pneumodissection is well known. Their further investigation of this pre-Descemet stroma confirms that it is stroma, and not a new corneal layer...[D]espite current trends to avoid medical eponyms", if such a medical eponym was desired then '‘the Feizi stroma’ would be more appropriate." ^ a b c d e f g Dua HS, Faraj LA, Said DG, Gray T, Lowe J (September 2013). "Human corneal anatomy redefined: a novel pre-Descemet's layer (Dua's layer)". Ophthalmology. 120 (9): 1778–85. doi:10.1016/j.ophtha.2013.01.018. PMID 23714320. ^ Olson, Samantha (13 June 2013). "New Cornea Layer Discovered In Human Eye: Doctors Predict Safer And Simpler Eye Treatments". Medical Daily. Retrieved 2013-06-14. ^ a b "New layer of human eye,'Dua's layer,' discovered behind cornea". Huffington Post Live Science. 12 June 2013. Retrieved 2013-06-13. ^ a b c d e Cynthia Fox (5 August 2013). "The commotion over the new cornea layer". BioscienceTechnology.com. ^ a b Hamish D. McKee; Luciane C.D. Irion; Fiona M. Carley; Arun K. Brahma; Mohammad R. Jafarinasab; Mohsen Rahmati-Kamel; Mozhgan R. Kanavi; Sepehr Feizi (May 2014). "Re: Dua et al. : Human corneal anatomy redefined: a novel pre-Descemet layer (Dua's layer)". Ophthalmology. 121 (5): e24–e24. doi:10.1016/j.ophtha.2013.12.021. PMID 24560565. Retrieved 2014-09-20. Abstract: We read the recent claim of the discovery of a new corneal layer by Dua et al with incredulity.1 The existence of pre-Descemet stromal tissue remaining after pneumodissection is well known. Their further investigation of this pre-Descemet stroma confirms that it is stroma, and not a new corneal layer. ^ a b Roger Steinert (1 October 2014). "A controversy in cornea". Medscape. Retrieved 2014-09-20. ... the purported discovery of a new layer in the cornea ... We all know that today it is quite frowned upon to use names of scientists to describe tissues. It's much more appropriate and helpful to use anatomic terms or physical terms that make sense. ^ a b Hamish D. McKee; Luciane C.D. Irion; Fiona M. Carley; Arun K. Brahma; Mohammad R. Jafarinasab; Mohsen Rahmati-Kamel; Mozhgan R. Kanavi; Sepehr Feizi (2014). "ANZ Cornea Meeting 2014 Abstracts" (PDF). p. 3. Retrieved 2014-09-20. Dua’s layer” is just previously described pre-Descemet stroma ... Medical eponyms have traditionally been created by one’s peers to commemorate the importance of a person’s contribution and findings. Dua has taken an interesting step of creating his own eponym, even before his claims have stood the test of further investigation and scrutiny, and despite current trends to avoid medical eponyms (and when they are used, to use the nonpossessive form). If one prefers a medical eponym to describe the pre-Descemet stroma that remains after pneumodissection, then ‘the Feizi stroma’ would be more appropriate. ^ "Scientists discover new layer of the human cornea" (Press release). University of Nottingham. 12 June 2013. Retrieved 2013-06-11.